Silly, bursting with songs and energy, and peppered with fantastic performances, Five Guys Named Moe is a joy. 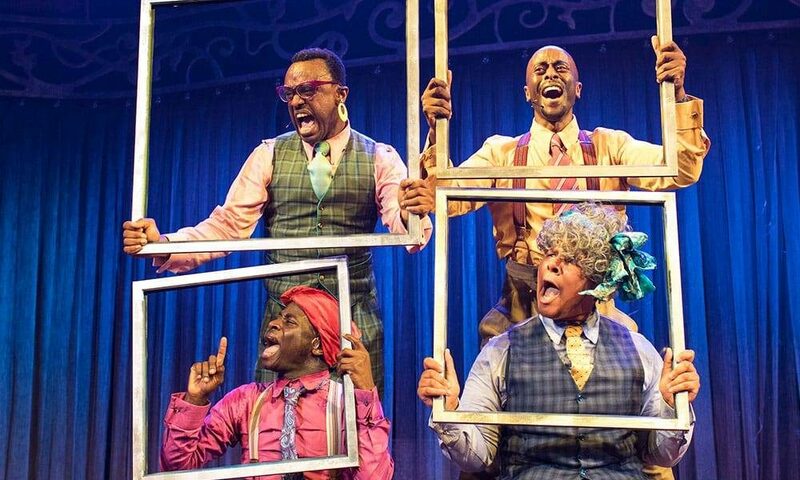 Directed by Clarke Peters, the musical had runs in the West End and on Broadway in the 90s, with the original productions winning and receiving nominations for several Olivier and Tony awards. Peters is back directing and he holds it all together wonderfully. The show follows Nomax, a down-and-out, and the five Moes who appear out of nowhere to sort out his life by singing countless Louis Jordan songs. The plot is irrelevant. It’s a framework for each Moe to play within: bounding around the circular stage, belting out tunes and cracking jokes. All six actors are on stage together for most the running time and are all on top form: funny, entertaining, tight but loose in all the right ways. There are one or two mistakes, but this is live, fast-paced theatre, delivered by a vibrant cast. The band, also, are excellent throughout and late in the show we are brought to a crescendo as they are unveiled from the background to huge applause. The Marble Arch Theatre is gorgeous, a sprawling, purpose-built venue that feels warm and genuine. The luxury of such a setting is that the excess set design can be stripped back; it feels like New Orleans in the 1940s without having to busy the stage with props. As for deeper themes and character studies, we aren’t breaking new ground here. Even though this musical deals with some dark subjects, it doesn’t pull them in so close that it becomes uncomfortable, it just isn’t that kind of show. There are some minor teething problems: the spotlight handler has issues keeping up with the performers, but in many ways, this just highlights the fact that we are watching a live piece of theatre – along with the moments of audience participation, which are good fun, if slightly clichéd. For anyone looking for a fun, all-singing all-dancing evening, Five Guys Named Moe is exactly that. Last night’s performance closed to a standing ovation, which says it all really. 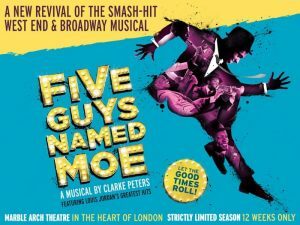 Five Guys Named Moe is at Marble Arch Theatre from 15th September 2017 until 18th January 2018. Book your tickets here.